Free film screenings relating to the themes in our current exhibition held off-site at KPL Central Library. The KWAG Film Series is an opportunity to explore documentary films that resonate with the themes of family in our current exhibition, I'll be your Mirror, through free screenings hosted by the Kitchener Public Library at the Central Library (85 Queen Street North). Stories We Tell is a genre-twisting documentary film in which filmmaker Sarah Polley investigates the elusive truth buried within the contradictions of her family history through a series of revealing interviews. 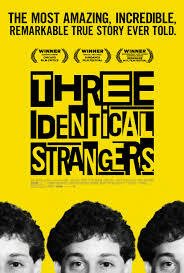 Tim Wardle’s documentary Three Identical Strangers follows identical triplets that are separated at birth and adopted by three different families. Years later, their amazing reunion becomes a global sensation but also unearths an unimaginable secret that has radical repercussions. Click here to reserve your seat for Three Identical Strangers on the KPL website. Registration is required for film screenings at the Kitchener Public Library – please use the links provided above to reserve your seats for your choice of screenings.